The Dragons board are believed to be willing to sell the British and Irish Lions forward for a six-figure fee given his limited availability because of international commitments. Former Wales back-five forward Jonathan Thomas says Faletau "has to move". 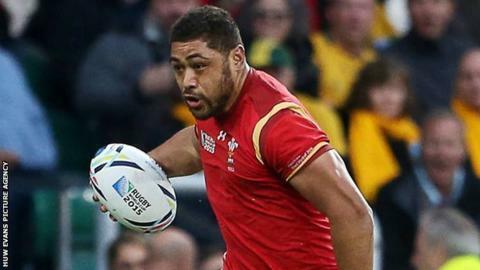 But Gatland has said he would not sanction such a transfer as it would potentially make Faletau unavailable for the national side. The Rugby Services Agreement (RSA) - the wide-ranging agreement between the WRU and the four Welsh regions - stipulates the need for Gatland's consent for any move deal. Under the RSA, Gatland can select only two players who have moved to play outside Wales since the agreement came into force in August. Centre Jamie Roberts and fly-half Rhys Priestland, who have joined Harlequins and Bath respectively, are two such players. Faletau's former Dragons team-mate Ian Gough says the Wales forward needs a new challenge away from Rodney Parade. "He needs a bit of stimulation after a quiet season or two for him at the Dragons," Gough said. "He's played very well in the World Cup and he's been brilliant on the international scene and it looks like he needs another challenge." In the meantime, Bath's newly-recruited Wales fly-half Rhys Priestland is taking an 18-month break from international duty.